Superb Country House Style Clubhouse with Bar, Catering, Changing Rooms, Showers, Pro Shop. Golf Practice Area. 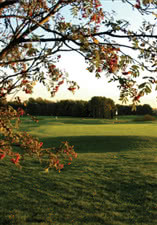 Founded in 1906 Stockport Golf Club is a hidden gem in the Cheshire countryside. Although situated less than 3 miles from Stockport town centre, the golf course has some wonderful views of the Peak District and is a challenging Regional Qualifying course for the Open Championship. Stockport was originally an open moorland course but was transformed in the 1960s by the planting of thousands of trees. As a consequence it is now a tree-lined, parkland course with generous fairways, played to large greens. The Clubhouse is a two storey building. The ground floor contains the Dining Room, the Mixed Lounge, which has a bar, and the Ladies' Lounge and Locker Room. The Gentleman's Locker Room is on the first floor which also contains the Gentleman's Lounge, Snooker Room, and "Spike" Bar. Visitors are welcome on any day. Contact club to make arrangements.